Hempstead Superintendent Shimon Waronker, who alleged violation of his free speech and due process rights, "has not set forth any actionable federal claims," U.S. District Court Judge Denis Hurley wrote. 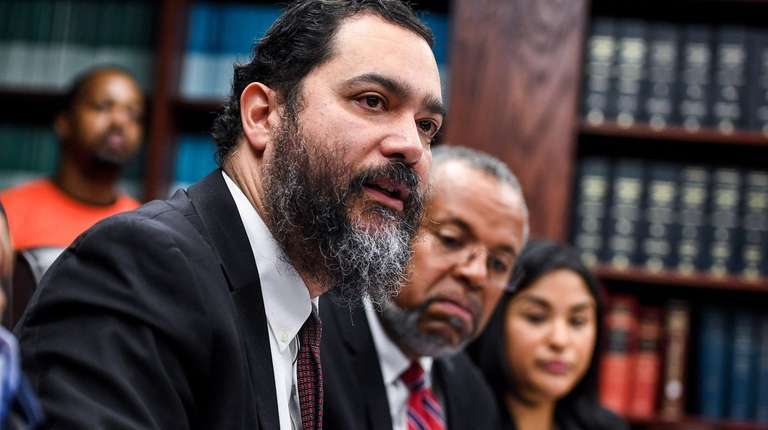 A federal judge on Wednesday dismissed Hempstead schools Superintendent Shimon Waronker’s lawsuit against the district, three members of the school board and the district clerk. U.S. District Court Judge Denis Hurley granted the district’s motion to dismiss the lawsuit, which Waronker filed in federal court in Central Islip a year ago, challenging the board’s Jan. 9, 2018, vote placing him on paid administrative leave while it investigated his actions as schools chief. Waronker alleged his right to free speech had been violated and that he was being punished for speaking out on corruption and mismanagement in the nearly 8,000-student district. He also claimed breach of contract and that his right to due process before being disciplined had been violated. Hurley, in his 18-page decision, wrote that Waronker was speaking as an employee, so his First Amendment rights had not been violated. Because Waronker was suspended with pay, he was able to follow proper procedures, and his contract was not breached, according to the judge's decision. “Notwithstanding the deeply troubling allegations brought against the School District and the Board, both with regards to their conduct toward Plaintiff as well as the long history of apparent corruption and neglect in the discharge of their duties, this is a Court of limited jurisdiction and the Plaintiff has not set forth any actionable federal claims,” Hurley wrote. “We will continue to vigorously defend our school district and community against meritless lawsuits and continue to focus on always putting our students first,” he said. “Some very wrong actions have been taken against Dr. Waronker, and we remain committed to seeing that our client’s rights are vindicated and that the law be fully and properly applied,” Brewington said in a statement. The school board, in an internal labor action in August, brought extensive charges against Waronker, alleging misconduct, bid-rigging and sham hiring, among other accusations. In October, the board filed amended charges, which have not been made public. Brewington, who released the August charges against his client, has called them “false and contrived to mask the real issues that Dr. Waronker was in the process of helping the district solve." Waronker remains on administrative leave. Under his contract, he is entitled to a hearing. No date has been set for any proceedings. Waronker, an administrator with a reputation for turning around low-performing and violent New York City schools, began working in Hempstead on June 2, 2017. The district, which is the largest K-12 system in Nassau County, has struggled for decades with low test scores, graduation rates and factionalism among board members. In fall 2017, relations soured between Waronker and a few members of the board, who criticized the district's awarding of a $450,000 contract to the now-defunct New American Initiative, a Brooklyn-based consulting firm he helped found. The board, after a shift in its majority, voted 3-2 placing Waronker on leave. Trustees Johnson, David Gates and Randy Stith, who were named in the lawsuit, voted in favor of his removal. "We intend to win and we intend to be reinstated, so that we can do the work," Waronker said then. Jonathan Scher, a Carle Place-based attorney who represents the district and the board, said Wednesday he was pleased with the judge’s decision. Brewington “literally ‘made a federal case’ out of facts that did not support a claim in federal court. We told him so," he said. “This was a misguided lawsuit from the beginning. It should have been dismissed." Judge's order dismissing Hempstead superintendent's lawsuitWaronker alleged his right to free speech was violated and that he was being punished for speaking out on corruption and mismanagement in the nearly 8,000-student district. Hempstead schools chief says 'nightmare' must endHempstead schools Superintendent Shimon Waronker, in his first public appearance since district trustees leveled charges ... District deadlocked on schools chief a year laterThe Hempstead school district placed Superintendent Shimon Waronker on administrative leave 12 months ago and through Dec. 31 had paid him nearly $277,100 in salary and benefits. LI school district sues firm for more than $2 million The complaint alleges the now-defunct education consulting firm "defrauded' the district by billing for work that wasn't performed and other practices.